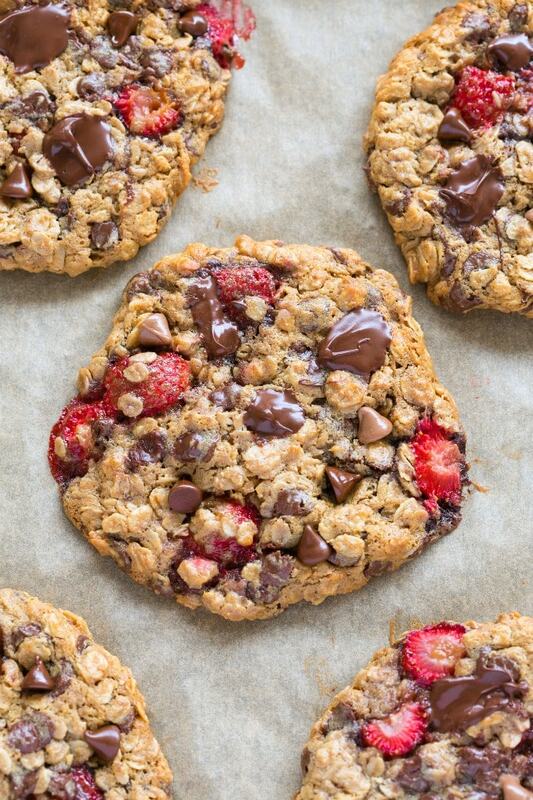 Easy flourless strawberry cookies made with oatmeal, chocolate chips and loaded with fresh strawberries! These healthy cookies are soft, chewy and take less than 15 minutes to whip up! Made without eggs and without sugar, these cookies are vegan and gluten-free! They also come with a tested paleo and keto option! 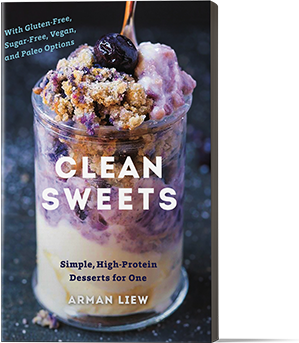 We love our easy healthy cookie recipes here. We’ve had zucchini cookies, banana bread cookies, and carrot cake cookies. It’s time for some strawberry action! Fresh strawberry chocolate chip cookies are my new favorite way to use up fresh strawberries. 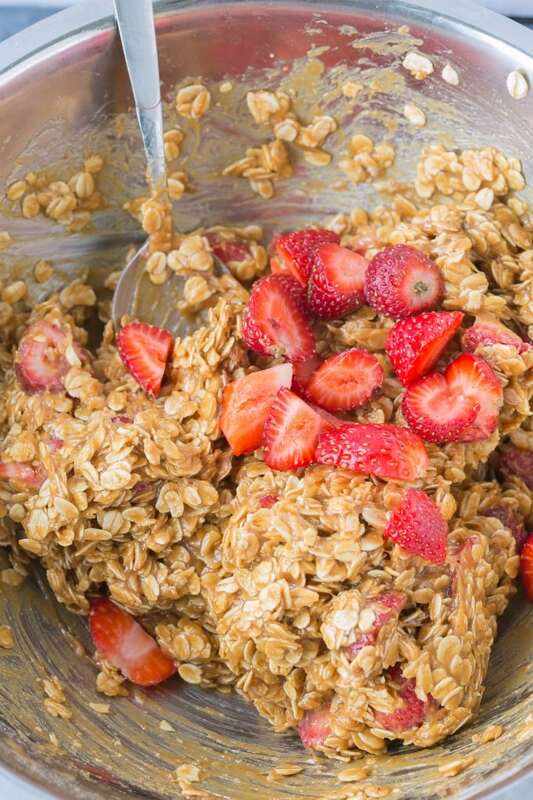 The combination of rolled oats, banana, peanut butter, and strawberries yield delicious and addictive soft baked cookies. Don’t get me wrong, I LOVE strawberries. However, when strawberry season comes along, I am always left with an abundance of them. Can you bake strawberries to cookies? 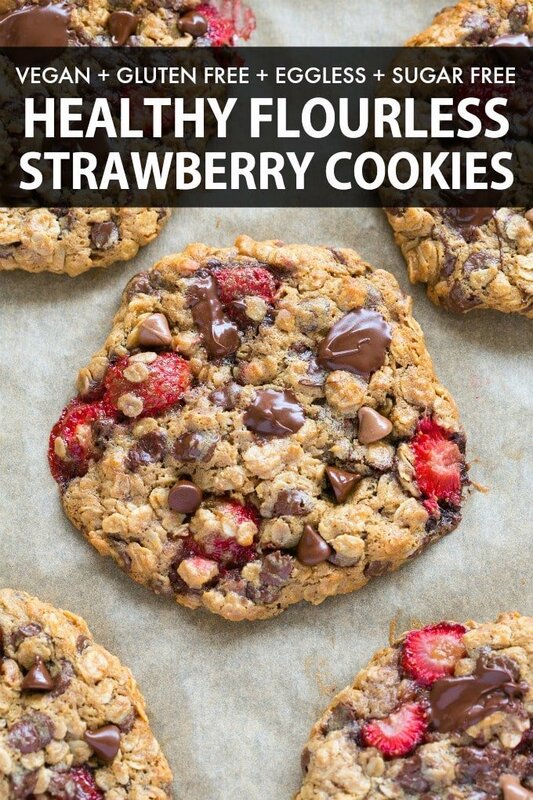 Adding fresh strawberries and baking them into cookies was a fantastic way to use them up. They also provide extra moisture (perfect for softer cookies!) and some natural sweetness. When paired with the mashed banana base, you’d easily satisfy the sweet tooth. Making these strawberry cookies are ridiculously easy and need to fancy ingredients. It has no flour, no eggs, and no butter, but relies on a bunch of other recipes to yield the perfect texture. Step 1: Preheat the oven to 175C/350F. 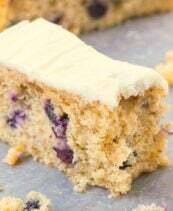 Line a baking tray with parchment paper or use a Silpat cookie sheet. Set aside. Step 2: In a large mixing bowl, combine all your ingredients, except for your chocolate chips, and mix well. Using a rubber spatula, fold in your chocolate chips. Step 3: Form 16 small balls of cookie dough. Place each ball on the lined tray or cookie sheet and press each one in a cookie shape. If desired, top with extra chocolate chips. Bake the cookies for 15-20 minutes, or until golden on the edges. Step 4: Allow the cookies to cool on the tray/sheet for 10 minutes, before transferring to a wire rack to cool completely. How to make these cookies keto and paleo? Making these cookies oatless and using keto/paleo approved ingredients is easy, and will yield the same texture. 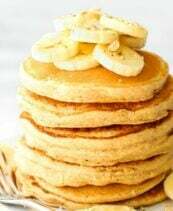 The main changes are omitting the oats (in favor of almond flour and shredded coconut) and replacing the banana with pumpkin. People often ask if you can have strawberries on a keto diet, and the answer is YES! Provided you use a small portion and balance out the rest of your net carbs for the day, strawberries are a great high-fiber fruit for the keto diet. Fresh strawberries are preferred, but frozen strawberries can also be used. I prefer the former as I’ve found the frozen kind tends to be less sweet. If you use frozen strawberries, be sure to thaw them out completely, and use a paper towel to remove any extra moisture. These healthy strawberry cookies are eggless and aren’t the best to keep at room temperature. Store leftover cookies in the fridge and keep them refrigerated until ready to enjoy. They will keep fresh (in a sealed container) for up to 1 week. Cookies are freezer friendly and will keep well frozen for up to 1 month. Do not overbake the cookies, as the exterior will become overly hard and the center be rubbery. Start checking the cookies around the 12-minute mark and remember, they continue to cook while cooling down. 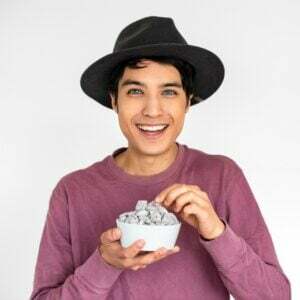 Either old fashioned oats (rolled oats) or quick oats can be used. Old fashioned oats will yield chewier cookies and instant oats will be lighter and a little softer in the center. These cookies aren’t overly sweet and rely on the strawberries, banana and chocolate chips for sweetness. Feel free to add some liquid stevia or maple syrup for extra sweetness. 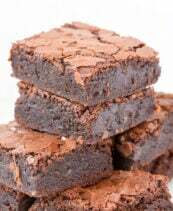 Use a combination of mini chocolate chips and standard chocolate chips, for the best texture. If you don’t have sunflower seed butter and want to keep these cookies nut-free, you can replace it with tahini or wow butter. If nuts aren’t an issue, peanut butter and almond butter are great. 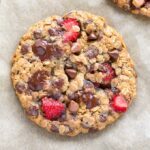 Easy soft and chewy strawberry chocolate chip cookies made with fresh strawberries and loaded with chocolate chips! Made without eggs and without butter, these delicious cookies come with a keto and paleo option! Preheat the oven to 175C/350F. Line a large tray with parchment paper or prepare a Silpat cookie sheet. Set aside. In a large mixing bowl, combine all your ingredients, except for your chocolate chips, and mix well. Fold through your chocolate chips. Form 16 small balls of dough and place each one on the lined tray/cookie sheet. 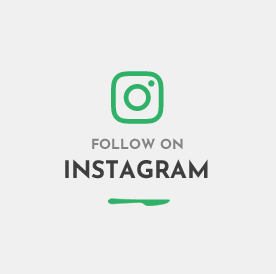 Press each ball into a cookie shape. Bake for 12-15 minutes, or until golden on the edges. Remove from the oven and allow cooling on the tray/sheet before transferring to a wire rack to cool completely. In a large mixing bowl, add your dry ingredients and mix well. In a seperate mixing bowl, add 1/4 cup of pumpkin and strawberries with the melted coconut oil and syrup and mix well. Combine the dry and wet ingredients and mix very well. If the batter is too thick/crumbly, add the extra 1/4 cup of pumpkin. Fold in your chocolate chips. Form small balls of dough and place on the lined tray/sheet. Press each ball into a cookie shape and bake for 12-15 minutes. Remove from the oven and allow cooling on the tray until completely cool. * Start with 1/4 cup and only add the other 1/4 cup if the batter is too thick. 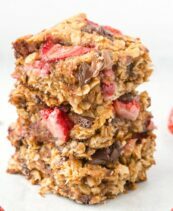 Healthy Strawberry Cookies (Vegan, Gluten Free, Paleo Option) should be stored in the fridge and will keep for 5 days.